Jesse Berrett earned a PhD in History at the University of California, Berkeley. He has worked as a rock critic, television columnist, and book reviewer. He teaches history at University High School in San Francisco. 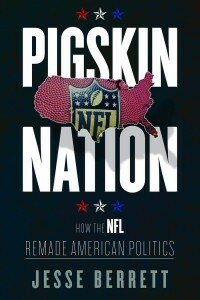 He recently answered some questions about his new book, Pigskin Nation: How the NFL Remade American Politics. I’ve been a Michigan Wolverines fan ever since I remember—lived in Ann Arbor until I was 7, decided at that point I would go back for college, did that, and still watch the games—and was reading about the Michigan/Ohio State rivalry in the 60s and 70s and came across an anecdote about the UM kicker’s being late to practice because he was at a protest. The simultaneous disjunction and conjunction—football as part of the time, but also opposed to what seemed like the period’s predominant values—stuck in my mind, and I wanted to figure out what was going on. What I discovered took me in entirely different directions. I ended up finding out that football fit much more comfortably, and even successfully, into the 60s than I’d expected. Q: What caused this shift from baseball to football as the All-American sport? Equal parts cultural fit and astute PR. Football was particularly well suited for a culture of technocracy, mass organizations, and computers (teams like the Cowboys pioneered data analytics and coding of players in the early 60s), and then intellectuals’ sudden discovery of the sport (I was surprised by how many thought pieces there were in the 60s in high-end magazines and journals that pondered football’s attractions, almost always written from the perspective of the intellectual-as-fan) induced them to analyze and amplify these connections. And then the NFL deliberately worked to cement this popularity in the minds of the public through books, films, and political positioning. So it was a happy collision of culture and sales. Q: How did football function for the American public, either as a distraction or as a “metaphor for American achievement,” as you put it, during the tense climate of the Vietnam War? It’s easy to find radicals lambasting football as figuratively (and sometimes literally) the cause of what the US was doing in Vietnam. In that sense football as both metaphor and reality merely expressed the same divisions you’d see elsewhere. What surprised me were the ways that football revealed some of the commonalities that remained under the surface—people like Hubert Humphrey and George McGovern were big fans, McGovern even taking on Redskins’ guard Ray Schoenke to head up Athletes for McGovern. And fighting over football, and how sports pages covered football and sports more generally, let more people engage in debate about where America was going. I see football as helping democratize the debate. Q: In the book you say that football’s popularity provided “a new language” for the debate over the meaning of America. How did the NFL capitalize on the different ways football was used in this debate? The NFL produced books and films telling people how vivid and contemporary the sport was and spent that new political currency on lobbying Congress to give it what it needed—keeping players off the front lines in Vietnam, making sure that anti-competitive measures like the merger between the AFL and NFL in 1966 were allowed. I was especially surprised by how interesting the NFL’s books were. You’d expect them to be decent corporate productions, maybe (or at least I did), but they’re smart—they take all the things intellectuals were saying and just throw them at the wall, admitting that football says something troubling about the inherent violence of American culture while also suggesting that it incarnates the admirable meritocracy that conservatives want to think they see. Films, especially once NFL Films started making them, explicitly and expertly celebrated the skill and precision football required while detaching viewers from the sport’s consequences. Q: How did Nixon use the sport to further his own political agenda? I’ve always been fascinated by Nixon—I had collected almost all of the Watergate memoirs as a high school student. Nixon simultaneously truly loved the sport (even sportswriters who hated him were impressed by how much history knew and how deeply he was attached to football) and wanted to use it to distinguish friend from foe to build a political coalition. Proper Americans played team sports, endured the pain of losing, and watched football; dissidents and weirdoes did none of these things. If he’d been more cynical, he’d have been more effective—his sense that sitting on the bench as a player at Whittier had taught him to take punishment was so sincere that it led him to emphasize that lesson over and over. In a very Nixonian and self-defeating twist, he used football to emphasize what he was against much more forcefully than what he was for. Q: What does Pigskin Nation have to tell us about football’s place in American culture today? I think the same conflicts and possibilities are true now that were true then; they’re just more obvious. Owners and politicians who use football to stake out political positions do so more openly, as with Trump and Texans owner Bob McNair; dissident players make more resonant statements and suffer more for them (as of this writing, both Colin Kaepernick and Eric Reid remain unsigned); those who find football’s violence troubling are now armed with specific data about the lasting physical harm it does to players. Both sides’ attachment to their positions have strengthened. My long-term prediction, since people have been asking me to guess the future, is that football will be more like baseball than boxing—still a prominent part of our culture, but no longer something that can convincingly claim to be the national pastime.